The Pasadena City Council will meet Monday, Aug. 3, at 6:30 p.m. in the Council Chamber (S249) at Pasadena City Hall, 100 N. Garfield Ave. The agenda, complete with downloadable reports, is available here. The meeting will be televised live on KPAS and via streaming video. The Historic Preservation Commission will meet Monday, Aug. 3, at 6 p.m. in the Hearing Room at the Permit Center, 175 N. Garfield Ave. 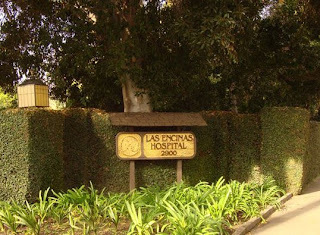 Agenda items include advisory review of comments to the Planning Commission and City Council about amendment to master plan for Las Encinas Hospital, 2900 E. Del Mar Blvd. ; and Mills Act update and guidelines. The Aug. 3 meetings of the City Council Finance Committee and the City Council Public Safety Committee have been canceled. The Accessibility and Disability Commission will meet Tuesday, Aug. 4, at 3 p.m. in the Grand Conference Room (basement S038) at Pasadena City Hall. Agenda items include distribution plan for ADA anniversary lapel buttons; list of possible ADA anniversary activities; update on planning for Reese’s Retreat play area; first draft of report on program access issues in city services; updated list of accessible pedestrian signal locations; planning for 2010 Rose Parade Accessible viewing areas; and review of public comments on first draft of updated ADA transition plan. The Recreation and Parks Commission will meet Tuesday, Aug. 4, at 6 p.m. at Pasadena Senior Center, 85 E. Holly St. Agenda items include update on city tennis program; and review of universally accessible play area equipment at Brookside Park. The Pasadena Community Access Corporation Board will meet Tuesday, Aug. 4, at 7:30 p.m. in the “green room” at KPAS, 2061 N. Los Robles Ave., Suite 109. Agenda items include discussion of security measures at PCAC facility; and cable service providers public access plans. The City Council Economic Development and Technology Committee (EdTech) will meet Wednesday, Aug. 5, at 6 p.m. in the Council Conference Room (S246) at Pasadena City Hall. Agenda items include proposed resolution authorizing the creation of a recovery zone under the provisions of the American Recovery and Reinvestment Act of 2009 for the purpose of issuing recovery zone economic development bonds. The Zoning Hearing Officer will conduct public hearings Wednesday, Aug. 5, at 6 p.m. in the Hearing Room at the Permit Center, 175 N. Garfield Ave. Agenda items include sign exception to exceed the maximum allowed size of one square foot per commercial sign (and a total of four commercial signs per use) in a residential zoning district for a religious assembly use at 1590 E. Del Mar Blvd. ; minor conditional use permit to allow on-site shared parking for an existing 74, 540-square-foot shopping center with 265 parking spaces at 85-161 W. California Blvd. (Vons Center); and (1) variance to reduce the required interior garage width for an existing attached one-car garaged at the rear of the property and (2) variance to allow an existing attached one-car garage to be located in the front of the property at 3203 Brandon St. The Code Enforcement Commission will meet Thursday, Aug. 6, at 4 p.m. in the Hearing Room at the Permit Center, 175 N. Garfield Ave. Agenda items include recommendation for property owner to take corrective action within 30 days regarding overgrown vegetation that provides harborage to rats and other vermin at 1155 Linda Vista Ave.; recommendation for property owner to take corrective action within 10 calendar days regarding nuisance dogs at 1551 N. Catalina Ave.; update on appeal of Super Liquor at 125 E. Orange Grove Blvd. regarding operation of a public nuisance; update on appeal of a decision regarding accumulation of junk and debris at 976 Glen Oaks Blvd. ; and update on construction without required building permits at 1015 N. Hudson Ave. The Northwest Commission will meet Thursday, Aug. 6, at 6 p.m. at Jackie Robinson Center, 1020 N. Fair Oaks Ave. Agenda items include report from Human Resources Director Karyn Ezell on employee statistical reports; discussion of parking study; recommendation from staff regarding amendment of the art exemption regulation and ordinance; code enforcement update; update on Lincoln Avenue Specific Plan; General Plan update; and update on Heritage Square project. 8 p.m. – FC Barcelona goes up against L.A. Galaxy in a soccer game with an expected attendance of 60,000. Tickets available through TicketMaster. Gates open at 6:30 p.m. Be prepared for extra traffic and activity if you live or work in the area. If you’re new to the neighborhood and don’t have a resident’s pass, get one right away because it’s the only way you’ll get through the barricades and to your home. Pick one up at the stadium administrative office, Pasadena Police Department, Fire Station #36 (1140 N. Fair Oaks Ave.) or Fire Station #38 (1150 Linda Vista Ave.). (626) 577-3100. 1, 3:30 and 7 p.m. – Children will discover “Creative Critters” at Hastings Branch Library, 3325 E. Orange Grove Blvd., where they’ll learn about animal body coverings and camouflage for survival of an invertebrate, amphibian, bird, reptile and mammal. (626) 744-7262. 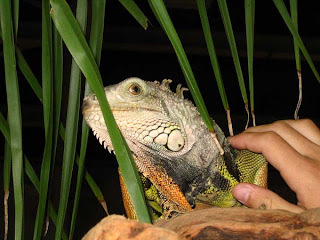 * 10 and 11:15 a.m., 1 p.m. -- Children will discover “Creative Critters” at La Pintoresca Branch Library, 1355 N. Raymond Ave., where they’ll learn about animal body coverings and camouflage for survival of an invertebrate, amphibian, bird, reptile and mammal. (626) 744-7268. * 3 p.m. – “Creative Critters” will be at Hill Avenue Branch Library, 55 S. Hill Ave. (626) 744-7264. * 5 to 8 p.m. -- A free event at Villa-Parke Community Center, 363 E. Villa St., celebrates National Night Out with children's activities, dancing, martial arts, boxing demonstrations, food, information about summer activities for children and teens, resources for health insurance and neighborhood organizing, and much more. (626) 744-6530. *11 a.m. – “Creative Critters” at San Rafael Branch Library, 1240 Nithsdale Rd. (626) 744-7270. * 3 p.m. – “Creative Critters” at Allendale Branch Library, 1130 S. Marengo Ave. (626) 744-7260. * 6:30 p.m. – As we gear up for the update of Pasadena’s General Plan, city staff have met with a number of organizations in the community. The sheer reality of time prevents them from meeting with everybody, so we’re calling on neighborhood leaders, business owners and others to plan their own Do-It-Yourself (DIY) workshops! Workshop kits will be available at a briefing on Aug. 5 in the Fair Oaks Conference Room (basement room 039) at Pasadena City Hall, 100 N. Garfield Ave. You’ll get an overview of the General Plan update process, a review of the DIY workshop kit contents, and step-by-step training on how to facilitate your own community workshop for your organization. (626) 744-6807. More information here. * 10 and 11:30 a.m. – “Creative Critters” at Santa Catalina Branch Library, 999 E. Washington Blvd. (626) 744-7272. * 10:30 a.m. – Teens are invited to a Monopoly tournament at Pasadena Central Library, 285 E. Walnut St., with two 90-minute rounds plus pizza and beverages. Official rules will be followed. Registration is required: (626) 744-4766. 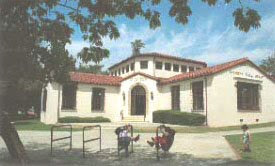 * 1 p.m. – “Creative Critters” at Lamanda Park Branch Library, 140 S. Altadena Dr. (626) 744-7266. * 3 p.m. – “Creative Critters” at Linda Vista Branch Library, 1281 Bryant St. (626) 744-7278. 11 a.m. to 3 p.m. – Beat the heat with hot dogs and lemonade, rides, raffles, music and more at City Councilman Chris Holden’s District 3 block party on Jackson Street between El Molino and Los Robles. (626) 744-4738. Here are few items that I've been meaning to post about but haven't had any time to do. After I posted the big reveal to the Mystery History photo about the first locomotive in Pasadena, including the contributions of J.F. Crank, Mike Coppess was kind enough to provide additional information about Crank on his East of Allen blog. Take a look -- it's fascinating. The City of Walnut Creek will throw a big retirement bash for him, but the PIOs who have known Brad for many years wanted to do something special for him. Everyone gathered on the patio of P.F. Chang's in Fremont (near San Jose), coming from as far away as Pasadena (moi) and San Clemente (Judy Rambeau Franz, whose hand is on my shoulder; she's the former PIO for the City of Santa Monica and is retired). Most of the others work for cities in the greater San Jose area, although Erin Blount (in red) made the two-hour trip from Sacramento where she is PIO for First Five. We gave Brad a scrapbook that encompasses his life as a PIO, which came as a pleasant surprise to him. 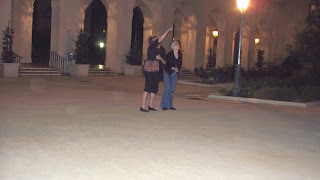 Two local bloggers paid me an evening visit at Pasadena City Hall recently. Karin Bugge and Petrea Burchard enjoyed the surroundings on this pleasant summer night. Petrea posted some photos from that evening on her blog, so check it out! A couple of great employees in the Public Affairs Office were born in July -- Zack Stromberg, my graphic designer, and Linda Centell, my assistant PIO. We had a surprise birthday party for them last week complete with a cake made with loving hands by City Manager Michael Beck. Speaking of the city manager, he welcomed and thanked our magnificent team of Public Affairs Office volunteers during a luncheon at Robin's Restaurant last week. Some work in the office and some work in the information booth in the grand entrance of Pasadena City Hall. We enjoyed the ribs and the chicken, and especially the desserts! This one is called a "messy sundae." 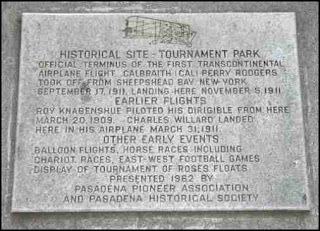 Liz wins with her guess "The first transcontinental airplane flight Calbraith CaliPerry Rodgers took from sheepshead Bay New York September 17 1911 landing at Tournament Park November 15 1911." 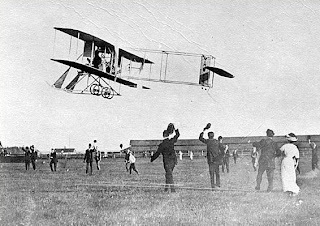 In the photo above, renowned aviator Calbraith Perry Rodgers takes off from Sheepshead Bay, New York (Long Island), on Sept. 17, 1911, in a contest to see who could complete the first transcontinental flight. This was neither an ordinary pilot nor an ordinary flight: Rodgers was a fearless risk-taker who didn't let anything stand in his way. In fact, you might call him the Chuck Yeager of his day. At about the same time William Randolph Hearst, in an effort to encourage aviation, put up $50,000 as a prize for the first pilot to fly a plane from coast to coast in less than 30 days, whether east to west or west to east. Rodgers jumped at the chance! He would pilot a Wright Company Model EX, a single-seater biplane with a 32-foot wingspan and no windshield. 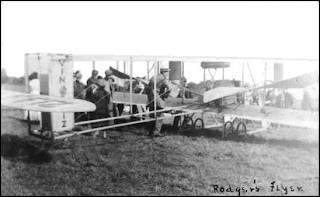 It was a modified Model B designed for very short exhibition flights. 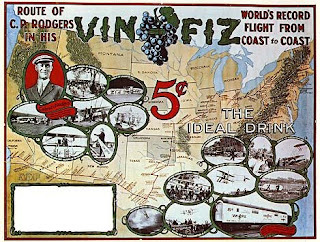 Armour and Company stepped up as the sponsor; in return, Rodgers named his plane "Vin Fiz" in honor of Armour's newly launched grape soft drink. When Rodgers took off from Sheepshead Bay, he carried the first transcontinental U.S. Mail pouch. Remember, this was a plane designed for exhibition flights, not distance. He missed the deadline and landed in Pasadena on Nov. 5 (another pilot* had already won the prize). During his transcontinental flight he used 1,230 gallons of gasoline, landed 69 times, had 15 accidents and lost 25 days due to weather and mechanical difficulties. Actually, he was expected on Nov. 4. It's a safe bet that Mayor William Thum was among the guests at a special gathering that day in Tournament Park organized by D.M. Linnard, owner of the Maryland Hotel. While they waited for the aniticipated arrival, there was a contest between the Reds and Whites of the Pasadena Polo Club. Shortly after sunset, the dignitaries received word that Rodgers would not be able to fly in until the next day. Rain checks were distributed to the crowd before they left for the night. The next day, after word had spread far and wide of the impending landing, more than 20,000 people showed up! . . .I soon saw Pasadena in the distance, but went to the wrong end of town before discovering my proper landing place. . .I did a few spiral glides for [the crowd] and then made a nice landing at about 4:04 o’clock. They gave me a royal welcome, congratulating me on all sides. I was escorted to a waiting motor car and driven around the track a few times, and they made me stand up so every one could see me. They had enveloped me in the American flag and they made a great hullabaloo. There were at least 20,000 persons there. They are certainly the most hospitable people that I have met and I hope I will be able to stay at Pasadena for quite a while. . . Spiraling downward from dizzy heights above, the greatest aviator in the world, who by sheer force of will and nerves of steel, had accomplished the impossible, stepped out from among his frail fabric of wood, wires and canvas to be wrapped in the American flag by Mrs. R. D. Davis, wife of the president of the Board of Trade, and Miss Irene Grosse. Thousands swarmed on the field to pay tribute to Rodgers. He was encompassed by battalions of the sweetest, fairest women in the land, the elite of all that is beautiful in Pasadena, conquered by a brave man and mighty pleased with the conqueror. Never once during this charge of beauteous femininity did the nerve of the aviator desert him, although once or twice he manifested some concern at the intentions of the sea of faces before him. There was but one single escape, however, over the same path which brought him there, but his motor had gone dead and he evinced no desire to remount into a region made impossible of pursuit by the stern rule of Sir Isaac Newton. Hence he remained and stood the test with the same iron nerve that characterized his transcontinental voyage. 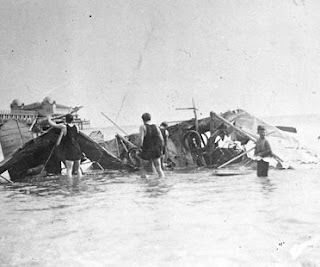 Although Pasadena was the official terminus of the flight, Rodgers set off for Long Beach on Nov. 12 with the intention of dipping into the Pacific Ocean. But he crashed along the way, sustaining serious injuries that delayed his goal by a month. He was determined to finish what he started, so with his leg in a cast and his crutches tied to the plane, he took off again on Dec. 10 and landed safely after touching his wheels into the water. 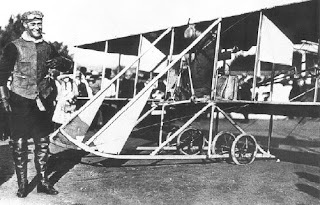 On Jan. 1, 1912, the very first aircraft flew over the Rose Parade route twice, at 9:45 and 10:15 a.m. It was the Wright biplane piloted by Cal Rodgers, who dropped rose petals all along the way to excited throngs. The parade began at 10:45 a.m., followed by chariot races and football at Tournament Park. ...Instead of gazing into clear sky dotted only by fleecy clouds, the spectators will have an aeroplane crossing and recrossing their path and rose petals will rain down upon them. 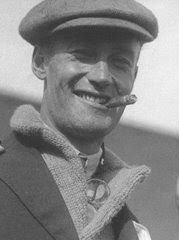 ...Aviator Rodgers is to make two flights in the forenoon before the parade. Each time he will fly from Tournament Park to a point over Orange Grove and back. Cal Rodgers was one of a kind. Although he didn't win the prize for his transcontinental flight, he became a household name at the time and had more national recognition than the winning pilot -- then and now. Four months after landing in Pasadena, he flew into a flock of birds near Long Beach and crashed into the ocean. He did not survive the impact. It was the 22nd fatality in American airplane history. This courageous aviation pioneeer was enshrined in the National Aviation Hall of Fame in 1964. On May 21 I posted about another aviation feat at Tournament Park. The park is privately owned. 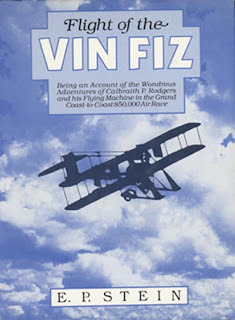 More about the "Vin Fiz" here. * Eight pilots entered the competition but only two -- Cal Rodgers and Robert G. Fowler -- successfully made it from coast to coast. Fowler won the $50,000 for flying from Golden Gate Park in San Francisco to Jacksonville, Florida, before the deadline. Many thanks to Pasadena Public Library, Pasadena Museum of History, Tournament of Roses Association, National Aviation Hall of Fame and Florida Aviation Historical Society. Here are City of Pasadena Highlights for the week of July 27, 2009. 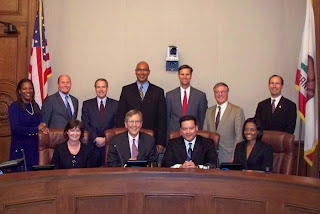 The Pasadena City Council will meet Monday, July 27, at Pasadena City Hall, 100 N. Garfield Ave. They will meet in closed session at 5:30 p.m. to confer with legal counsel regarding Henderson v. City of Pasadena; and confer with legal counsel regarding consideration of initiation of litigation. The public portion of the meeting will begin at 6:30 p.m. in the Council Chamber (S249). * Nuisance Liquor Store – Pasadena’s Deemed Approved Ordinance was established to give local officials the authority to regulate older liquor stores that don’t have conditional use permits, hold the owners accountable for related problems that affect nearby neighborhoods, and require the liquor stores to operate within a set of local standards. During a public hearing conducted last month by the Code Enforcement Commission, it was determined that Super Liquor is a nuisance, and the owners were directed to take corrective action. On Monday night the owners of Super Liquor will appeal the commission’s decision. * Assistance with Electric Bills – Three years ago the council approved the Electric Utility Assistance Program for low-income customers. As it stands currently, the basic benefit is a $5 monthly credit for customers who meet income eligibility criteria or use medically necessary electronic life support or mobility equipment. The council will consider directing the city attorney to preparing an ordinance to increase the basic monthly benefit to $7.50. The full agenda, complete with downloadable reports, is available here. The Commission on the Status of Women will meet Monday, July 27, at 6 p.m. in the Rose Bowl Press Box (second floor), 1001 Rose Bowl Dr. Agenda items include Pasadena Birthing Project Executive Roundtable; report on June 30 District 6 Town Hall meeting; report on Five Acres gang awareness workshop; and report on Passageways Homeless Connect Day planning meeting. The Design Commission and Historic Preservation Commission will have a joint meeting Monday, July 27, at 6 p.m. at Pasadena Senior Center, 85 E. Holly St. Agenda items include advisory review of comments to the Planning Commission and City Council regarding the Las Encinas Hospital Master Plan Amendment. Please note there will be a 4:30 p.m. site visit to the property at 2900 E. Del Mar Blvd. The Design Commission will meet Monday, July 27, at 7:30 p.m. at Pasadena Senior Center, 85 E. Holly St. Agenda items include conflict of interest and Brown Act; and application for consolidated design review for addition to and substantial alterations of an existing 10,218-square-foot building for use as an urgent care facility at 3180 E. Del Mar Blvd. Please note there will be a 5:15 p.m. site visit to the property. The July 27 meeting of the City Council Finance Committee has been canceled. The City Council Municipal Services Committee will meet Tuesday, July 28, at 4:15 p.m. in the Council Conference Room (S246) at Pasadena City Hall. Agenda items include Congestion Revenue Right Resolution/California Independent System Operator agreement; update on Public Benefit Program results; update on Power Master Plan; and update on Smart Grid and stimulus funding application. The Fair Oaks Avenue Project Area Committee will meet Tuesday, July 28, at 6:30 p.m. at Jackie Robinson Center, 1020 N. Fair Oaks Ave. Agenda items include report on Sparklean Laundry Systems; and report on Robinson Park/street name changes/field naming rights. The City Council Legislative Policy Committee will meet Wednesday, July 29, at 8:15 a.m. in the Fair Oaks Conference Room (basement S039) at Pasadena City Hall. Agenda items include cap and trade programs (AB 32 – California Global Warming Solutions Act of 2006 – and HR 2454 – American Clean Energy and Security Act; proposed opposition of Senate Bill 14 (California Clean Energy Bill) unless it is amended; update on AT&T’s U-Verse system and carriage of Public, Education and Government (PEG) access programming; American Recovery and Reinvestment Act stimulus update; SB 545 (Freeway Construction); and briefings by David Jones on state legislative matters and Carolyn Chaney on federal legislative matters. Noon to 5 p.m. – Don’t miss the Buck-A-Bag book sale at La Pintoresca Branch Library, 1355 N. Raymond Ave. Bring your own canvas bag and stock up! (626) 744-7268. 2 p.m. – Teens will make baskets and other objects in the oriental fusion style from recycled materials at San Rafael Branch Library, 1240 Nithsdale Rd. Class size is limited, so call (626) 744-7270 to reserve your spot. More details here. 3 to 4:30 p.m. – Teens will create designs and then learn how to screen-print them onto T-shirts during this five-day workshop with instructors from Armory Center for the Arts at Lamanda Park Branch Library, 140 S. Altadena Dr. Registration is required and space is limited, so call (626) 744-7266! 5 to 7:30 p.m. – If you’re one of the thousands who use the Rose Bowl Loop for walking, bicycling, skating, dog-walking and other activities, stop by the tents at Brookside Golf Club and Lot K to see preliminary plans for improving the area. More details here. (626) 744-4610. 4 p.m. – Enjoy the animated film “Bolt” (rated PG) in the Donald R. Wright Auditorium at Pasadena Central Library, 285 E. Walnut St., with the voices of John Travolta, Miley Cyrus, Malcolm McDowell and James Lipton in the story of the canine star of a sci-fi/action TV show who believes his powers are real and sets out on a cross-country trek to save his co-star from what he believes is a real threat. (626) 744-4066. * 10 a.m. – Hey, kids! 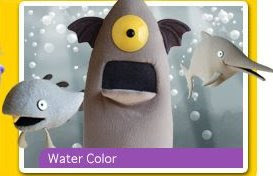 The Swazzle Puppets will tell the story “Water Color,” complete with a one-eyed underwater monster and other creatures of the deep in the Donald R. Wright Auditorium at Pasadena Central Library. * 1 p.m. – The Swazzle Puppets will do their act for kids at La Pintoresca Branch Library. * 3 p.m. – And the Swazzle Puppets will move on to Villa-Parke Branch Library, 363 E. Villa St. (626) 744-6510. * 6:30 to 9 p.m. – You’ve got the roof and you’ve got the sunshine, but do you have the facts on how to go solar for less? Attend the “Going Solar” workshop at the Salvation Army Tabernacle, 960 E. Walnut St., to learn about up-front costs, tax breaks and rebates, buying and leasing options, and much more. Reserve your spot here or call (626) 744-6970. 3:30 p.m. -- Enjoy the animated film “Tale of Despereaux” (rated G) at Hill Avenue Branch Library, 55 S. Hill Ave., with the voices of Matthew Broderick, Dustin Hoffman, William H. Macy and Christopher Lloyd in the story of a misfit mouse, an unhappy rat and a bumbling servant girl whose fates are intertwined with that of the castle’s princess. (626) 744-7264. 8 p.m. – FC Barcelona goes up against L.A. Galaxy in a soccer game with an expected attendance of 60,000. Gates open at 6:30 p.m. Free shuttle service to and from Old Pasadena! Be prepared for extra traffic and activity if you live or work near the stadium. If you’re new to the neighborhood and don’t have a resident’s pass, get one right away because it’s the only way you’ll get through the barricades and to your home. Pick one up at the stadium administrative office, Pasadena Police Department (207 N. Garfield Ave.), Fire Station #36 (1140 N. Fair Oaks Ave.) or Fire Station #38 (1150 Linda Vista Ave.). (626) 577-3100. More details here. Jonathon wins with his guess "It's the Pasadena Motorcycle Club, founded in 1907." 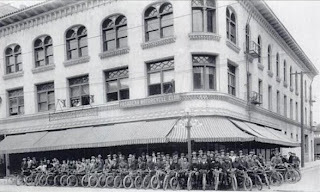 In the photo above, members of the Pasadena Motorcycle Club pose for posterity before heading out for a 163-mile round-trip rally to Ventura on April 28, 1911. They're in front of the Victor Marsh Building at the northeast corner of Raymond Avenue and Green Street. The building still stands today, although it has been significantly altered. The first floor at that corner is now occupied by redwhite+bluezz. Here's a photo of Carl Marsh on the way to Pasadena for the rally, stopping to rest with his Indian among the orange groves. 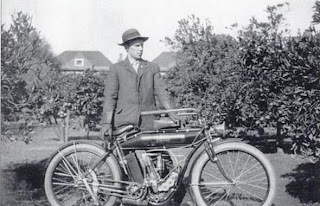 Founded in 1907 as a sporting club that held Hare and Hound races in the local orange groves, the Pasadena Motorcycle Club celebrated its 100th anniversary in 2007. They even have a Facebook page! Karin wins out of sheer tenacity: "I figure if I keep saying the same thing week after week, eventually I'll be right. People walking on colorado blvd when Pasadena was known as the Indiana Colony." Close enough, kiddo! Hey, I'm nothing if not fair. In the photo above, a parade of Indiana Colony residents heads west down Colorado Street in September 1885 to celebrate the coming of the first railroad to these parts. ...the whistle of the first locomotive to enter the good town echoed in every household and sounded its new note of progress. The citizens hurried with one accord down Colorado Street to view the iron horse, the first to enter, and bid it a merry welcome. Morris W. Reeder, who died in 1917 at Lamanda Park, held the throttle and enjoyed himself sounding the shrill jubilation loud and often, until the most distant and most inattentive must know that something unusual was afoot—as indeed it was. In 1872 a number of families escaped the coldest winter ever experienced in Indiana and settled here. Getting here wasn’t easy: They had to take a train to San Francisco, then a ship to San Pedro, then ride on wagons inland until they came upon this lovely little spot at the foot of the San Gabriel Mountains. In 1874 they officially named the spot the Indiana Colony. Two years later the Southern Pacific Railroad left bustling San Francisco and headed down brand new tracks bound for Los Angeles (population 10,000), linking the two cities for the first time. The growing colony was quite satisfied with a stage for a time, it was safe and it was picturesque; but better and quicker service was hoped for. To Stanley P. Jewett, a young engineer, there came the idea of a railroad communication between Los Angeles and the fertile valley of the San Gabriel; tapping its settlements and growing with them—that was the expectation. Jewett lived in the Indiana Colony, where he had come in 1879, and had pondered much over this idea. Jewett tried to get L.A. bankers to invest in his plan – including James Filmore Crank* who lived on a ranch in these parts called Fair Oaks – but the deal fell apart and the bankers walked away. Except one. J.F. Crank had a change of heart and brought together other Indiana Colony investors including his brother-in-law, Albert Brigden, who also had a ranch, and this group of local investors raised $450,000 for the ambitious effort. There were fits and starts throughout the project, from rights of way being only partially secured to contractors going belly up. So Jewett took charge of the entire endeavor. A public meeting was called by the exercised people, who passed very urgent resolutions voicing the loudly expressed sentiment declaring “the importance of bringing the locomotives to our very doors, etc,,” all of which is somewhat different than some of the expressions now heard, which declare that this road is a menace upon our streets and must be removed! A committee made up of Indiana Colony leaders who have streets named after them today – including J.P. Woodbury and James Craig – worked with Jewett to maneuver through legal mazes and other complicated matters. 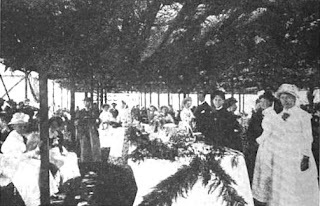 Beginning that celebratory day, the train ran on a regular schedule between L.A. and the Indiana Colony. 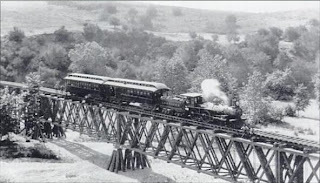 Tourists, new residents and entrepreneurs began flocking to the area via the LA&SGV Railroad. The next year, in 1886, the town known as the Indiana Colony was incorporated and renamed Pasadena. And the rest is no mystery! * J.F. Crank was a nationally famous figure in his day. After purchasing Fair Oaks Ranch from Judge Benjamin Eaton, Crank hired workers to till the soil, then planted the first varietal citrus seeds in the Indiana Colony. The seeds germinated and grew into trees, and he made a fortune off this area's first orange groves. 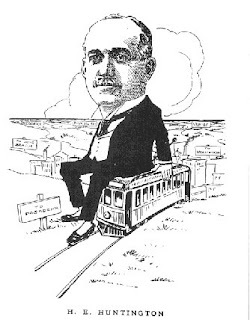 After bringing together the local investors for the railroad line to Pasadena, Crank became president of the Los Angeles & San Gabriel Valley Railroad, the tracks of which went all the way to Duarte before he sold the rights of way to the Santa Fe Railroad for a whole heck of a lot of money. He was also among the investors who created Monrovia. Where are we? And what's happening here? The first person to guess correctly will win a fabulous prize! I'll have the full scoop on Thursday. Don't cry to me that there's nothing to do in Pasadena this summer. That just means you haven't looked! The City of Pasadena offers plenty of free events and activities for children and teens. 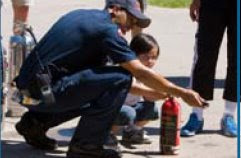 This annual five-Saturday course from 9 a.m. to noon for children ages 6 to 12 and their parents is taught by Pasadena police officers and firefighters and includes stranger danger, fire safety, disaster preparedness, environmental stewardship, community leadership, water skills, outdoor safety, bike rules and more. It begins this Saturday, July 11, and space is limited, so call (626) 744-7659 TODAY to see if there's still some room for you! Saturday, July 11, noon to 2 p.m. -- Teens who like reading manga will love this program at Pasadena Central Library, 285 E. Walnut St. You'll see new anime releases and critique them. Your reviews will go directly to the companies that produce the anime. While you're at it, join our official anime club! * 2 to 4 p.m. – Make beautiful baskets and more from recycled milk cartons based on a traditional style from Japan during the five-day Oriental Fusion camp at Pasadena Central Library. Class size is limited, so call (626) 744-4766 to reserve your spot! * 2:30 to 5:30 p.m. – Professional photographer Janell Mithani will help you learn how to take their best shots and then enter their best work in a photography contest during the Digital Photography camp at Allendale Branch Library, 1130 W. Marengo Ave. Class size is limited, so call (626) 744-7260 to reserve your spot! * 3 to 5:30 p.m. – Discover fun, quick and healthy recipes during the five-day Fast Food Fixings camp at San Rafael Branch Library, 1240 Nithsdale Rd. Class size is limited, so call (626) 744-7270 to reserve your spot! * 3:30 to 6 p.m. – Learn a choreographed jazz piece during a five-day dance camp at Hastings Branch Library, 3325 E. Orange Grove Blvd. Class size is limited, so call (626) 744-7262 to reserve your spot in the dance line! The teens will perform the piece for friends and family on Saturday, July 18. Tuesday, July 14, 7 p.m. -- Teens will see a presentation by City of Pasadena naturalist Elise Jackson at Hastings Branch Library, 3325 E. Orange Grove Blvd., then head out for a hike to explore our local wilderness. * Wednesday, July 15, 4 p.m. – “Tale of Despereaux” with the voices of Matthew Broderick, Dustin Hoffman, William H. Macy and Christopher Lloyd in the story of a misfit mouse, an unhappy rat and a bumbling servant girl whose fates are intertwined with that of the castle’s princess. Donald R. Wright Auditorium at Pasadena Central Library, 285 E. Walnut St.
* Tuesday, July 21, 4 p.m. -- "Bolt" with the voices of John Travolta, Miley Cyrus, Malcolm McDowell and James Lipton in the story of a dog who is the star of a sci-fi/action show who believes his powers are real as he embarks on a cross-country trek to save his co-star from perceived danger. Allendale Branch Library, 1130 S. Marengo Ave.
* Thursday, July 23, 3 p.m. -- "Horton Hears a Who" with the voices of Jim Carey, Steve Carell, Carol Burnett, Amy Poehler and Jamie Pressley in the beloved tale by Dr. Seuss of an imaginative elephant who teaches his young friends about the amazing world around them. Hill Avenue Branch Library, 55 S. Hill Ave.
* Wednesday, July 29, 4 p.m. -- "Bolt" comes to the Donald R. Wright Auditorium at Pasadena Central Library. 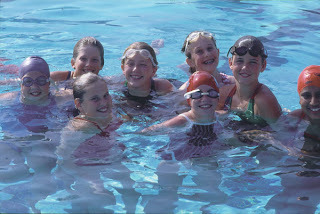 There are plenty of free (and low-cost) activities at parks and pools throughout Pasadena. Explore the opportunities here. Please note that for all summer recreation programs, enrollment is limited and spaces are filled on a first-come, first-served basis. Monday, Aug. 3, through Friday, Aug. 8, 7:30 a.m. to 4:30 p.m. -- Forty teens ages 13 to 18 will be chosen for a five-day seminar to learn about police and fire careers. They'll discover everything they need to know about the duties of police detectives, forensics teams, traffic officers, jail staff and more at Pasadena Police Department headquarters, then move on to Pasadena Fire Department HQ to learn about fire safety, survival skills and more. Interested? Contact Officer Vito Gaxiola at vgaxiola@cityofpasadena.net or (626) 744-7651. Day One, the City of Pasadena and many other organizations sponsor daily activities and field trips for children and teens throughout the month of August. Click here for the calendar and more information. Click here for more on children's programs. Or here for more on teen programs. Paul Little wins this week's fabulous prize with his guess "workers building the flood control channel south of Devil's Gate Dam." 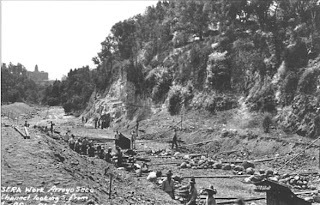 In the photo above, State Emergency Relief Administration (SERA) workers dig a channel through the Central Arroyo Seco in 1934. Earlier that year, the Los Angeles County Flood Control District had been reorganized with a semi-independent commission, and a flood bond issue was passed by voters shortly thereafter. This trapezoidal channel with a soft bottom was constructed from Devil's Gate Dam to Holly Street. The English translation of Arroyo Seco -- Dry Stream -- is deceiving. 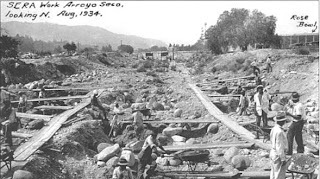 Many floods have come crashing through the Arroyo Seco, including the worst in L.A. County history in 1884, and continuing over the next 50 years. The 1930s was an era of large-scale construction projects all over the U.S. by otherwise out-of-work Americans who were employed by SERA as well as the federal Civil Works Administration and Works Progress Administration. Here's the same 1934 project, but this time we're looking south. 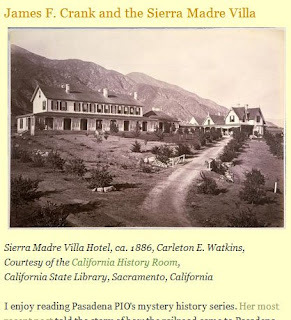 Note the Vista del Arroyo Hotel. The SERA workers weren't responsible for the ugly concrete channel -- that came later, in the 1940s, as the Army Corps of Engineers' response to a devastating 1938 flood. Since the early 1990s the removal of the concrete has been a high priority in Pasadena. I don't want to get too far afield from this week's Mystery History photo, so we'll talk about the restoration of the natural stream bed another time. Many thanks to Pasadena Public Library and the Arroyo Seco Foundation. Today is Independence Day, and tonight there will be a fireworks spectacular at the Rose Bowl Stadium. Please remember it's illegal for you to purchase, sell or use fireworks in Pasadena. Don't take my word for it -- read all about it here. 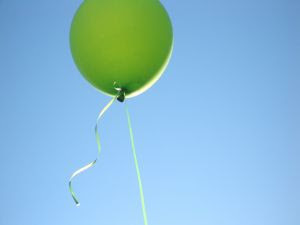 It's Friday, so here's this week's green balloon in solidarity with the oppressed people of Iran. Jean Spitzer wins this week's fabulous prize with her answer "Raymond? And the Red Car line is being removed?" In the photo above, taken Oct. 28, 1940, Pacific Electric Railway tracks have been removed on Raymond Avenue just north of Walnut Street (looking north) and the road is being prepared for all-new paving -- without rail tracks -- to accommodate automobiles. 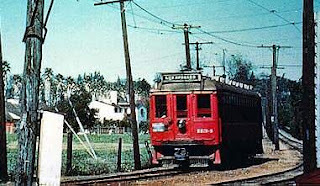 The Pacific Electric Railway was also known as the Red Car System. In their heyday, two lines to and from Pasadena and Santa Monica -- the Short Line and the Oak Knoll Line -- boosted tourism tremendously with the promise of taking passengers "from the mountains to the sea" in one relatively quick trip (with stops along the way, including downtown Los Angeles). It all began with the all-electric Pasadena & Pacific Railroad -- the P&P as it was more commonly known -- in 1885. The P&P connected Pasadena and downtown Los Angeles. Henry Huntington, who had recently incorporated his new Pacific Electric Railway, purchased the P&P in 1901. As the nephew of tycoon Collis P. Huntington, railroading was in Henry's blood. He was the subject of this drawing illustrating his impact on the area's growth. 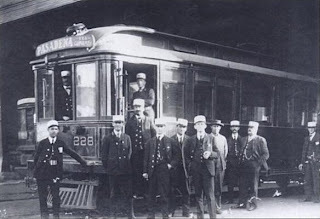 He maintained control of Pacific Electric Railway (PE) until 1911, when he sold it to Southern Pacific. Many people thought the horseless carriage was a passing fad -- why spend a then-whopping $850 for such a thing? -- and few dreamed of actually owning one. Besides, there were no highways yet and few paved roads on which to drive automobiles. So the PE's Red Cars served as the primary mode of transportation for getting to work, shopping, going to social engagements and other necessary excursions. 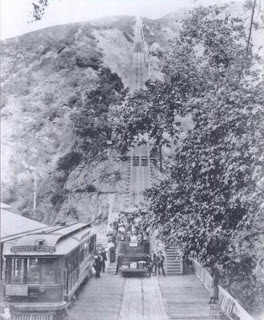 PE's most popular line for tourists was the Mount Lowe Railway, which Henry Huntington purchased in 1902. It closed in 1938 after a fire destroyed the Alpine Tavern and a bad rainstorm seriously damaged the tracks. When Henry Ford began mass-producing automobiles in Detroit at an affordable price -- $270 by the 1920s -- the popularity of the Red Cars began to wane. 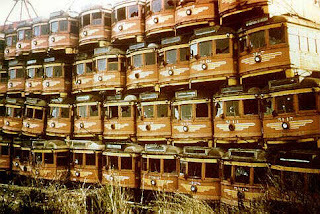 PE found it increasingly difficult to earn profits from passenger service for a number of reasons, including the cost of electricity, the Great Depression and the growing popularity of automobiles, so they greatly reduced the number of Red Cars, introduced more profitable bus lines and began using their rails for hauling freight. 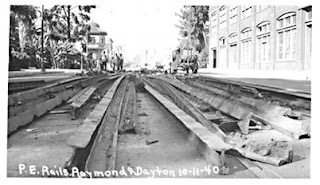 Here's a photo of rails being removed on Raymond Avenue at Dayton Street, also in October 1940. And here's an example of road-paving in Pasadena to make way for autos: city Street Department workers grading Hill Avenue between Washington Boulevard and the northern city limits in 1938. History's a funny thing, isn't it? Passenger rail has returned to Pasadena. Many thanks to Pasadena Public Library, Pasadena Museum of History, the Volkmer Collection and Jim Walker for use of the photos.